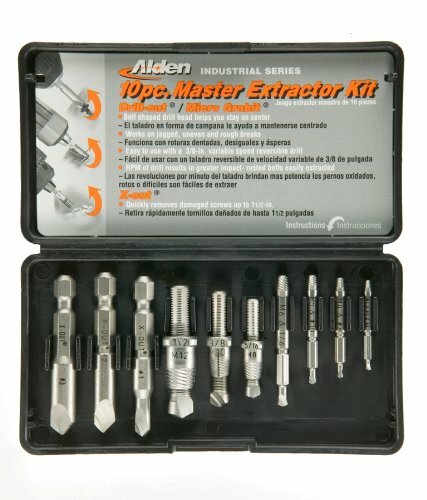 Alden DRILL-OUT Broken Bolt Extractor Kit contains 10 tools for removing damaged screws and broken bolts with the use of a power drill. It is made from high speed tool steel for long life and combines a drill bit as well as extractor in one tool. Bell-shaped drill heaad allows tool to be pivoted inside drill hole helping to stay on center. No pilot hole required. Self centering drill tip; no walking or wandering. No grinding, center punching required. Works on jagged uneven rough breaks. No grinding, Center punching required. Tempered twice for extra hardness. Results in multiple extractions per tool. Made from M2 HSS. Highest quality steel used and made in the USA. If you have any questions about this product by Alden, contact us by completing and submitting the form below. If you are looking for a specif part number, please include it with your message.